Waiouru had been rocking around on her moorings for the last couple of days. Fortunately its been calmer at night. 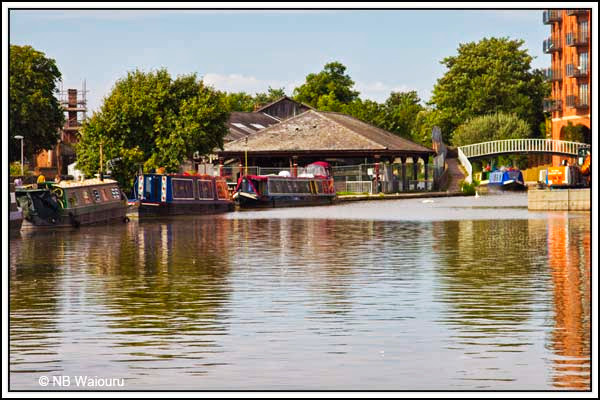 CRT is in the process of dredging the basin below the three staircase locks. A local fisherman was telling us that he can remember when the water depth was six foot but recently he was able to walk out into the basin and the water didn’t get above his knees. We certainly remember the mud being churned up on our trip into the basin a week ago. CRT are undertaking the dredging using four barges to hold the dredgings and two tracked excavators, one of which is positioned on a pair of floating pontoons. They also have a small tug to move the barges. 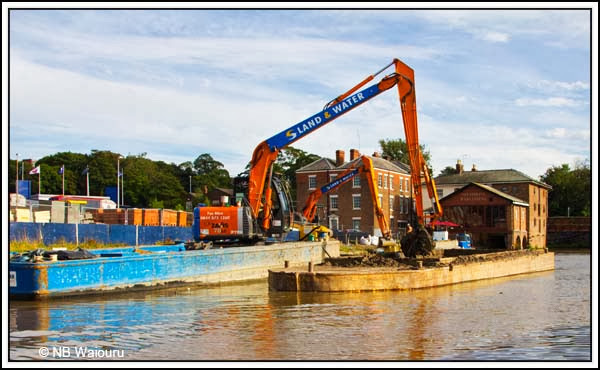 Their method is to fill the barges using the floating excavator and the tug then positions the barges against the bank where the second excavator unloads them into waiting tippers. 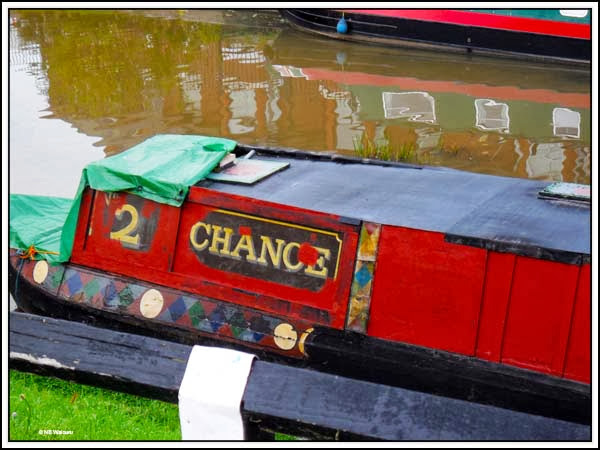 As you can see in the above photo the barges are filled to within six inches of the gunwale. When empty they have approximately two feet of freeboard. The operation appears to have an incorrect mix of resources because work usually comes to a halt after a couple of hours. The reason for this is because all the barges are filled and there are no empty tippers on site. The workers arrive and start work promptly at 7.00am but after a couple of hours work they wait for the tippers to return. Either more tippers or barges are required. 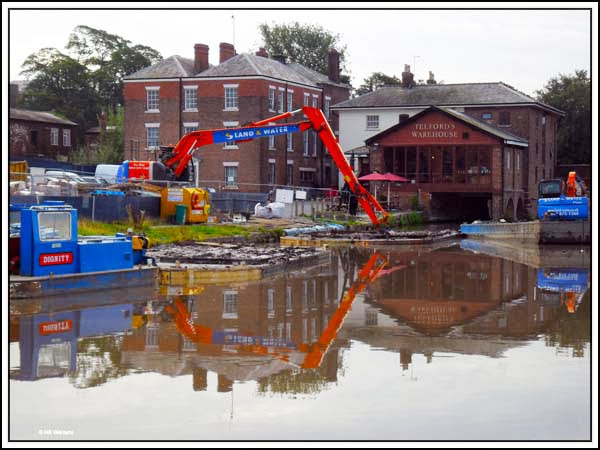 I also suspect the dredging using the excavator is a bit ‘hit and miss’ but I assume the water movement from the emptying of the locks will eventually level out the bottom. It looks like they are dredging to a depth of six feet! At the far end of the basin is the historic Taylor’s Boatyard with it’s covered dry dock. Waiouru moored in front of the dry dock. 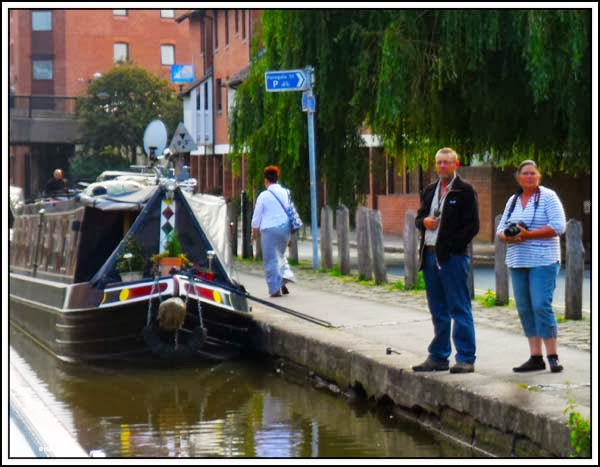 There are two well known boats moored in the adjacent short length of canal leading to the River Dee. James and Doug are here! But then we might have erred in our judgement! Jan locked Waiouru back up the staircase 3 but first had to empty the two chambers. I thought I might assist and opened the lower gates on the bottom chamber before moving Waiouru into it. I then needed to close the gates, but I was down in the chamber. The rung ladder on the sidewall of the lock was wet and covered in slime. Rummaging around in the boat locker I found two gloves to wear when climbing the ladder. I grabbed the centreline and put on the gloves only to find they were both for the right hand. This wasn’t an insurmountable obstacle as I was able to fit a right glove on my left hand. Waiouru started to drift forward in the lock so I placed the end of the centreline between my teeth and started climbing. Waiouru continued to drift forward. I found myself in the position of climbing up the side of the lock with a rope that was steadily getting shorter. By the time I reached the top of the ladder my head was pulled well to one side and I was attempting to drag Waiouru back using teeth and neck muscles! Once Waiouru was secured I closed the lower lock gates and went looking for Jan to borrow her windlass. She wanted to know why I hadn’t taken one from the boat. Well with my first and second hands I was climbing the ladder. 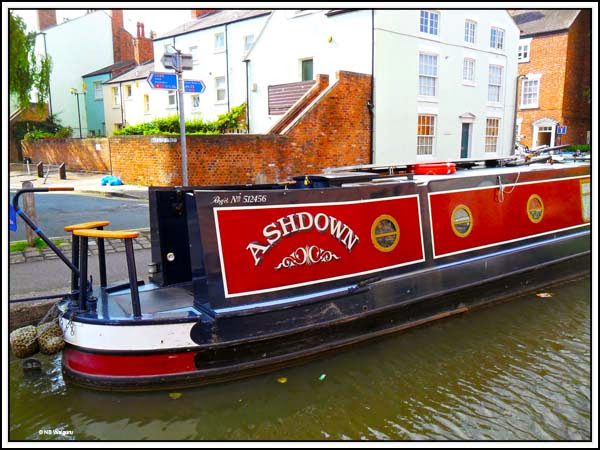 With my third hand I was holding the centreline and my fourth hand would have held the windlass….. but wait……. I don’t have a fourth hand! There are two bridges across the canal above the locks. The furthest is a conventional road bridge but the nearest is very narrow. I’d like to know why this first bridge is so narrow. Jan thought it might be a pedestrian footbridge but there doesn’t appear to be any access for the ends. I noticed there is what appears to be a buttress opening to the left which might indicate there used to be a second arch. 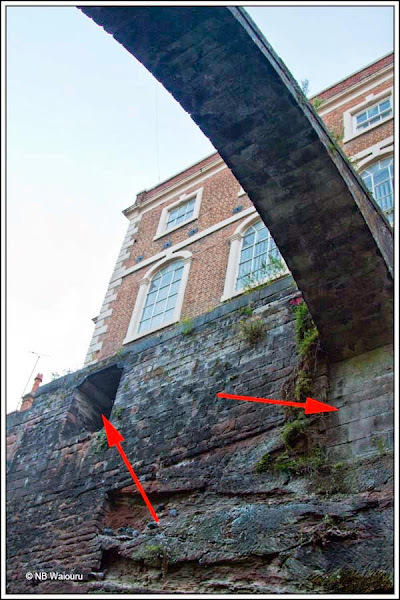 You might have also noticed the underneath of the existing arch has either been filled in or strengthened. It’s a mystery! There were two people watching as we rounded the bend onto the 48 hour moorings near Iceland. 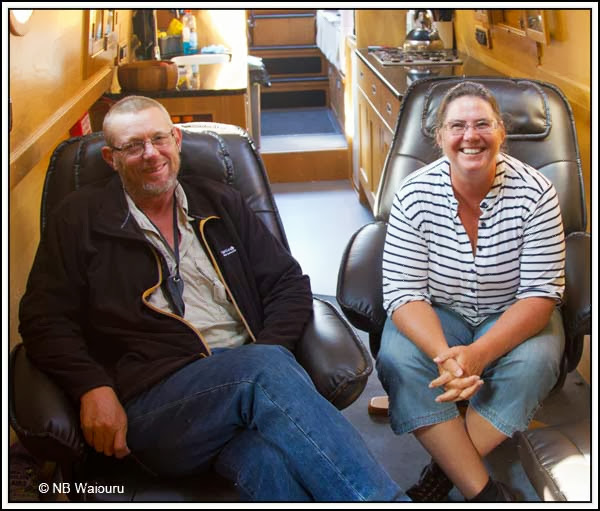 It was fellow continuous cruisers and bloggers, Andrew and Michelle, kiwi’s from Christchurch who are over living on nb Ashdown. We all retired on board Waiouru for morning tea and a gossip. They are heading towards Ellesmere Port whilst we are obviously going in the opposite direction. They are thinking of wintering-over in the Birmingham area whilst we plan to be around Rugby. No doubt we will meet again during our travels. I usually tuck the windlass in my belt, freeing up my third hand. I think I would have loosely held the centreline in one hand while climbing the ladder. 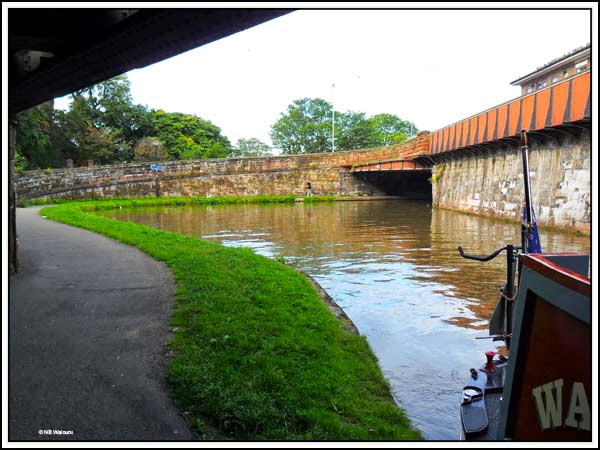 Alternatively I would have bowhauled the boat into the lock! I was wearing shorts with an elastic waistband. Tucking the windlass into the waistband would mean I'd be "blue mooning" Chester. If I had held the rope in one hand then I'd would have needed to climb the top third with only one hand ans the other would be stretched out with the rope. 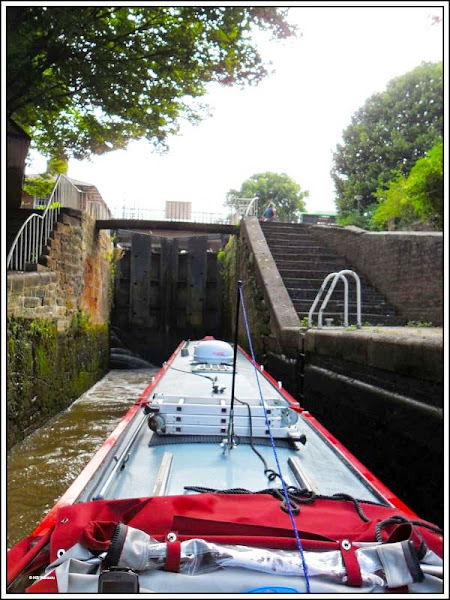 It would have been difficult to bow haul the boat into the lock (not impossible)because it was very deep. 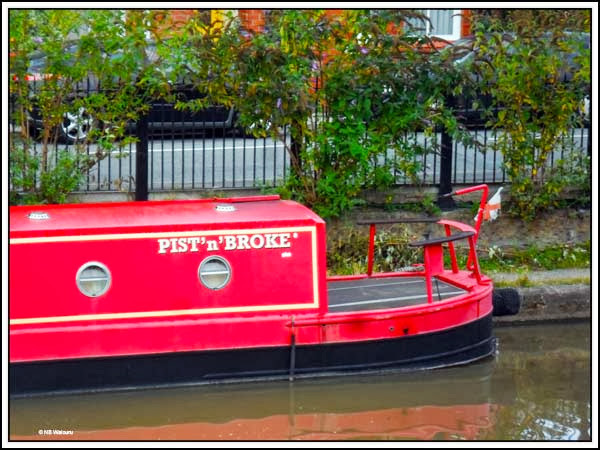 Actually I hadn't planned to leave the boat when I motored it into the lock! 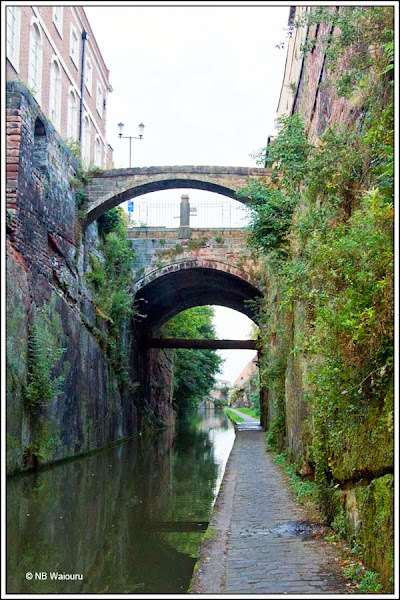 I believe the narrow bridge is known as the bridge of sighs that led from the Northgate gaol, across the Chester Canal, to a chapel in the Bluecoat School. It was built to allow condemned prisoners to receive the last rites before their execution. The bridge was built probably in 1793. It originally had iron railings to prevent the prisoners from escaping. The architect was Joseph Turner.